The Graves Group continues to work towards advances in semiconductor processing technology. A sample of recently completed projects are described below. 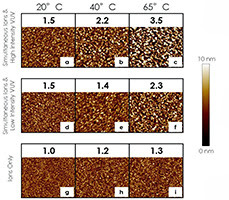 Photoresist roughening during plasma etching processes is of critical importance as device dimensions are approaching nanometer scales. 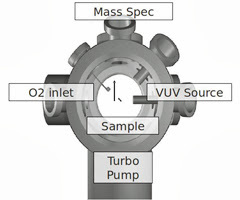 To date, the beam system study has focused on characterization of surface roughness of a model 193 nm photoresist under exposure of 150eV argon ions, vacuum ultraviolet (VUV) photons, and 1keV electrons. Previous results from our lab have shown that surface roughness increases with increasing photon/ion flux ratio and substrate temperature. Also, the surface roughness of 193 nm photoresist after simultaneous ion and high intensity VUV radiation at 65oC is comparable to argon plasma exposures. 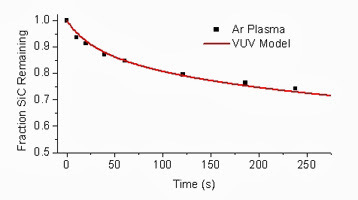 It highlights that VUV photons and moderate heating of a substrate play an important role in photoresist roughening in inert gas plasma exposures. 1keV electron irradiation with ions and VUV is further investigated. Inductively coupled plasmas and a vacuum beam system for mimicking plasma components are used to understand damage mechanisms during normal plasma processing. Typically, damage is tracked by chemical shifts in the IR spectrum which indicate loss of important species that improve performance. In particular, the VUV radiation that is emitted from plasma discharges is examined for these effects.